Top 10 Contouring + Highlighting Products with Tutorials. One of the biggest trends in makeup right now is contouring and highlighting. Let's face it. Contouring and highlighting can be overdone or it can be done beautifully. There are two important factors when it comes to a great contoured look: products and application. This post is going to focus a lot on products and a little on application - which takes some work. There are a lot of contouring and highlighting products available, but there are some that are definitely better than others; some are actually pretty easy to use. 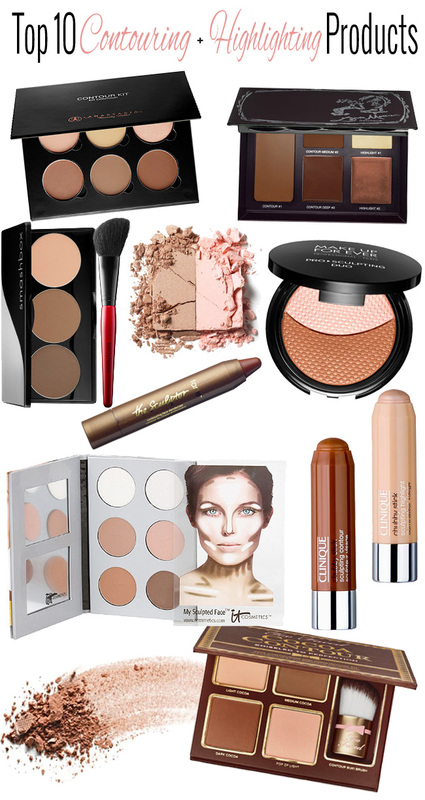 Out of all that I have come across, I have found the following contouring and highlighting products to be the best. First thing is first. You need the perfect complexion, and that starts with foundation. If you are looking for the best foundation, check out this list of the best department store foundation. Now to put the top 10 contouring and highlighting products to work properly, it takes practice. Now, you don't need to go all out crazy and do really dramatic contouring for every day. Some subtle cheekbone contouring and highlighting can make a world a difference. I've found some really great tutorials that teach you how to contour and highlight the right way. The secret is to adjust how much product you use by toning it down so the look works for you. This video shows a very detailed tutorial and technique that uses a lot of contouring and highlighting to totally redefine your features a la Kim Kardashian. This would be a look for special events - definitely not for every day. This video shows a tutorial with details tips on highlighting and contouring that could be used for every day, though it is a bit more on the dramatic side. I would lighten it up just a bit or just contour the cheekbones and bit of the now. Very pretty! Find even more great highlighting and contouring product suggestions from my beauty blogging friends.